kf = filtration coefficient which is the product of surface area of glomerular membrane and its permeability. 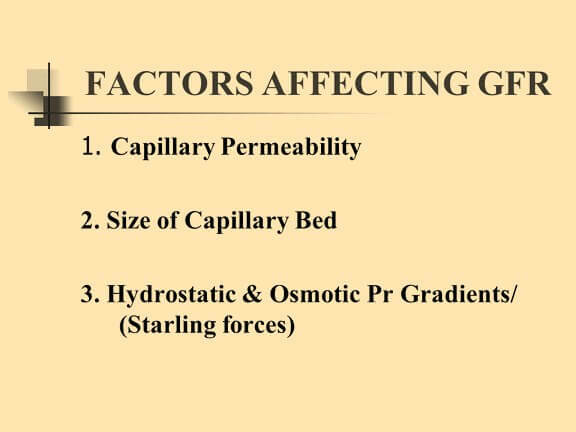 πGC = glomerular capillary hydrostatic ,pressure ,pGC = colloidal osmotic pressure of glomerular, capillaries PT = tubular hydrostatic pressure ,πT = osmotic pressure of tubular fluid (since there is no filtration of proteins, this pressure is nil). Net filtration pressure = 50 – 25 – 15 = 10 mmHg. The rate of glomerular filtration is 125 ml/ min for an adult having 1.72 sqmt of surface area. In female, it is 10% lower and in old age the GFR is less. creatinine. The latter is an endogenously produced substance. Its clearance measurement is very convenient and less cumbersome. We should keep in mind that the plasma measurement of creatinine will not reflect any renal dysfunction. Inulin is a fructopolysaccharide, obtained from the dhalia tubers. Its molecular weight is 5200. It is innocuous and filtered freely at the glomerulus. It shows neither reabsorption nor secretion in the renal tubules. Hence, the rate of excretion will be equal to the rate of filtration. It is the ratio between the GFR and RPF. Its value is 0.2.That means 20% of renal plasma is filtered in one circulation. The FF value is increased in conditions that lowers blood volume, i.e. hemorrhagic shock. Number of active glomerular capillaries. The GFR and RBF remain constant within normal limits over a wide range of arterial blood pressure change (90 to 200 mmHg). This is due to the autoregulation mechanism described earlier. The GFR is affected, if the mean arterial blood pressure does not occur within the autoregulatory range.